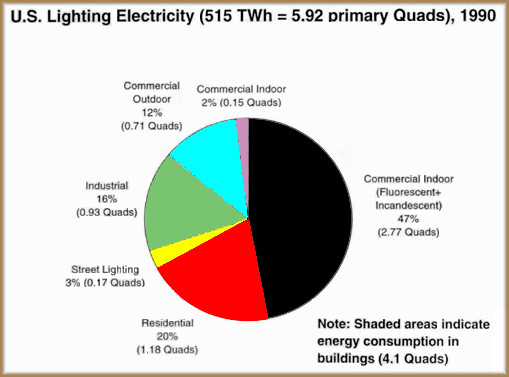 Almost half of U.S. lighting energy goes into commercial indoor lighting. This sector includes stores, offices, and schools. This explains why lamp makers have committed so much of their research resources to improving fluorescent lamps--the most common lamp in the commercial sector. While residential lighting energy seems small in comparison (only 20%), this is a bit misleading. Most homes and apartments are lighted by incandescent lamps that are cheap and easy to use, but very inefficient. As there are so many residential users of light, even small gains can mean big savings if enough people adopt the more efficient product. To read the chart above, a few definitions are needed. Electricity consumption is measured in "watt-hours" which is simply the number of watts used times the number of hours the electricity flows. A common unit of measure for home owners is the "kilowatt-hour." One kilowatt-hour is equal to 1000 watt-hours. Measuring electricity on a national scale calls for even larger increments, though. "TWh" in the chart stands for terawatt-hours. One TWh is equal to one billion kilowatt-hours. Electricity is not the only form of energy, however. A common measurement of energy is the British Thermal Unit or BTU. A BTU is the quantity of heat needed to raise the temperature of one pound of water one degree Fahrenheit. "Quad" in the chart stands for one quadrillion BTUs, and is a measure often used in energy industries. Chart by Lee R. Anderson, compiled from information in "Analysis of Federal Policy Options for Improving U.S. Lighting Energy Efficiency: Commercial and Residential Buildings," December 1992, Lawrence Berkeley National Laboratory, U.S. Department of Energy.